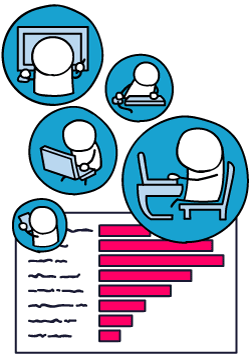 Collect highly-targeted study participants effortlessly. Our participant recruitment service makes it easy for you to access millions of study participants around the world. Why use our recruitment option? You no longer need to fill out forms, send emails or follow up on quotes from research agencies — do it all from your account. Your pricing will vary based on your requirements, the demographics you choose and the time it takes for people to complete your study. We promise quality responses, with results arriving in real time, within a couple of days. You can access and choose from over 19 million individuals from more than 50 countries around the world. Previously, quality market research was only available to big corporations, leaving everyone else priced out of reaching consumers. Now, you can recruit targeted participants at an affordable price. Sign up or log in to start recruiting. Once you fill out the panel form, you’ll be asked to pay the amount that is quoted for the participant recruitment. You can pay for this service with your existing card or by entering new card details when prompted. You can generally expect results in a couple of days. The delivery schedule will change in real time as you select your target audience, so you’ll know what to expect. What demographic options can I choose from? 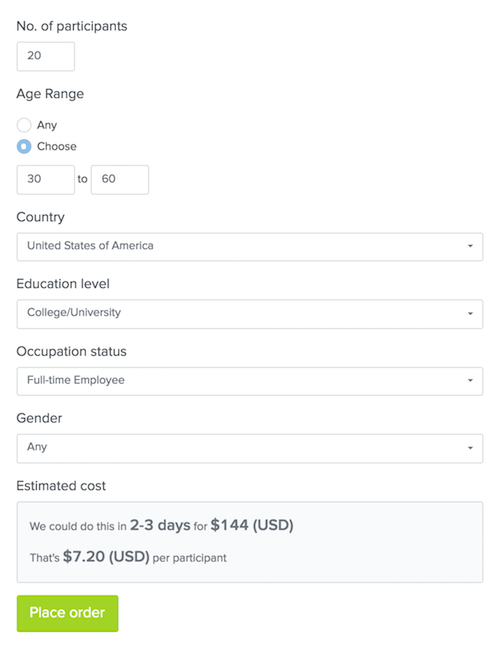 At present, you can target your participants by age, gender, country, education level, and occupation status. We’ll be adding more targeting options in the near future.